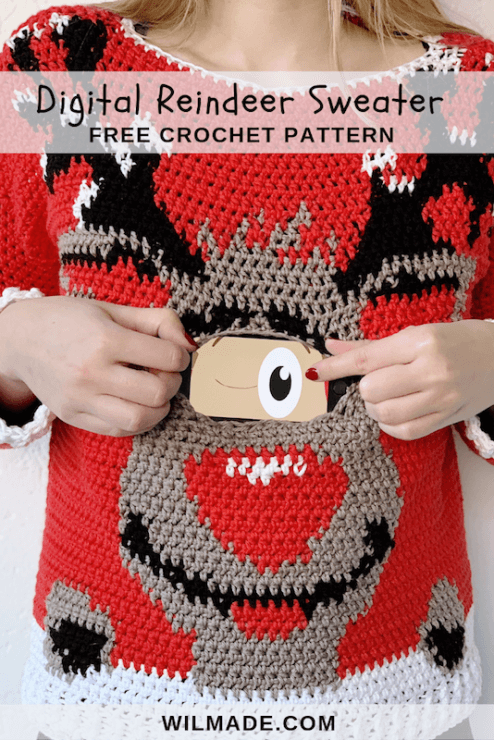 Today I have a special Digital Reindeer Christmas Sweater to share with you! It’s a hilarious design with a reindeer that has moving eyes. The eyes are created with a (free) app and smartphone. The pattern includes instructions for sizes S up to 3XL. You’ll definitely steal the show with a lot of oohing and aahing over this sweater! Last year I saw some amazing sweaters which made use of an app to create digital effects. This immediately inspired me to make a digital crochet sweater. 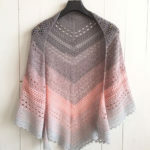 Of course I can also just buy a sweater, but the more handmade, the better! 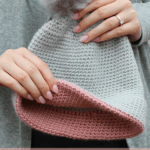 The design is simple: it’s made with half double crochet stitches, color changes on the front panel to create a reindeer and a nice brim on the bottom of the body and sleeves. The sweater is made out of two squares sewn together. The sleeves are made afterwards by working from the armpit to the wrist. The sweater can be made with or without the special digital option. 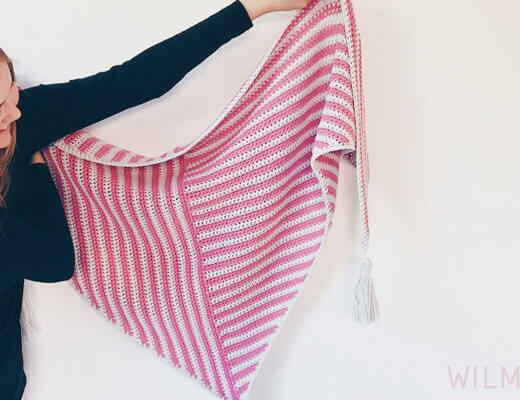 All pictures in this blog post show a digital version, but the pattern below includes instructions for a normal sweater (which is even easier and faster than the digital version). This pattern includes instructions for sizes S to 3XL. The sweater is slightly oversized and based on the official sizing regulations from the Craft Yarn Council (CYC). If you’re in between sizes, size down. 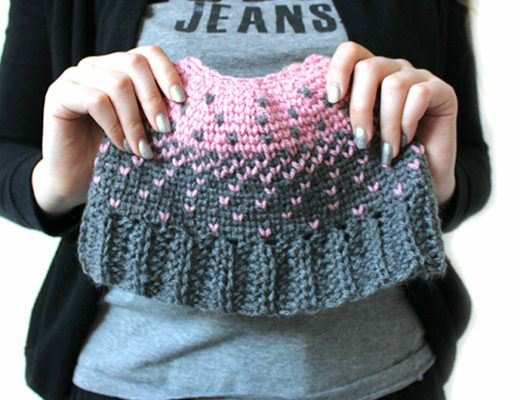 You can easily make adjustments by skipping or adding stitches on both sides of the sweater. Just make sure the reindeer stays in the middle of the front panel. For this sweater I’ve used Yarn and Colors Super Must-Have, a luxurious 100% mercerised cotton. This yarn comes in a range of 50 shades and is very affordable considering the quality of the yarn. 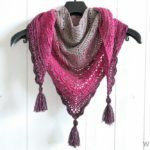 It’s bulky 5 weight and works up fast, which is perfect for a sweater like this. For reference, model is 1.69m/5’6″ tall with a 36” bust and wearing the sweater in size S/M. If you are between sizes, please size down as the sweater is oversized. – Pattern is worked bottom-up on two panels separately which are then sewn together at the sides and shoulders. Sleeves are joined at the armhole and worked in continuous rounds. – HDC stitches are worked through 3 loops (in between the stitches) except the sleeves. – Be sure to check gauge. You can easily use other yarn, but make sure it’s close to the gauge I used. This sweater is designed to be oversized, so if your yarn is bigger, size down. – Pattern contains instructions for sizes S/M, L/XL, 2XL/3XL. Directions for sizes are in parentheses such as “chain 63 (75, 89)” whereas ch 63 stands for size S/M, 75 for size L/XL, 89 size 2XL/3XL. When only one number is given, it applies to all sizes. To follow the pattern more easily, circle all numbers pertaining to your size before beginning. In this video you can see how to make the sweater. Please ignore the different backgrounds, lightnings and nail colors. I started this project in 2017 and finished in 2018 and had to record on many different places. 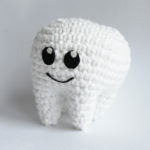 We’re now going to work with hdc stitches. Start every row with 2 turning chains which do not count as the first hdc. 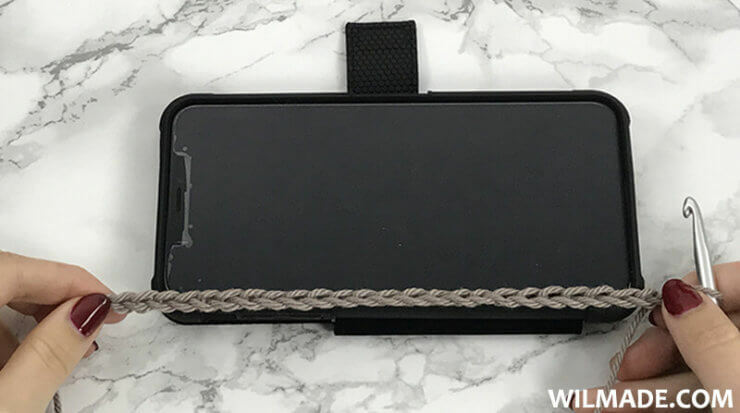 I personally didn’t like the ribbed effect of a normal hdc stitch (worked through 2 loops), so I decided to insert my hook through all three loops (in between the stitches). Finish off. 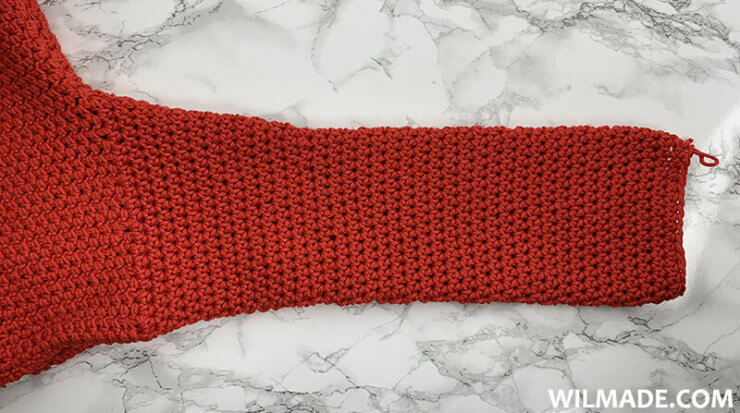 If you want to make the sweater longer, add a few more rows with red. Don’t forget to add those extra rows to the front panel as well. We’re now going to use the graph below. Each square on the graph will be one hdc in that specific color. Start every row with 2 turning chains which do not count as the first hdc and don’t forget to insert the hook through all 3 loops (in between the stitches). Repeat row 32 – 38 on the other side. This should result in a gap of 8 stitches in the middle. This is where we will place the phone. Finish off. If you want to make the sweater longer, add a few more rows with red. Don’t forget to add those extra rows to the back panel as well. If you want to make a normal sweater without digital eyes, you can skip the gap part (row 32-39) and continue making 1hdc in each st across, while following the color changes in the graph below till row 70 (74, 78). After both body panels are completed, lay them on a flat surface, right sides facing each other. Make sure to align the rows of each piece. Sew up to row 48 on each side, starting on the bottom of the sweater. This should leave 22 (26, 30) st for armhole. Continue working on the shoulder seam. Align the stitches of the top rows and start sewing on the outside. Sew up 18 (20, 23) stitches on both sides. This should leave 24 (32, 40) st for neck opening. 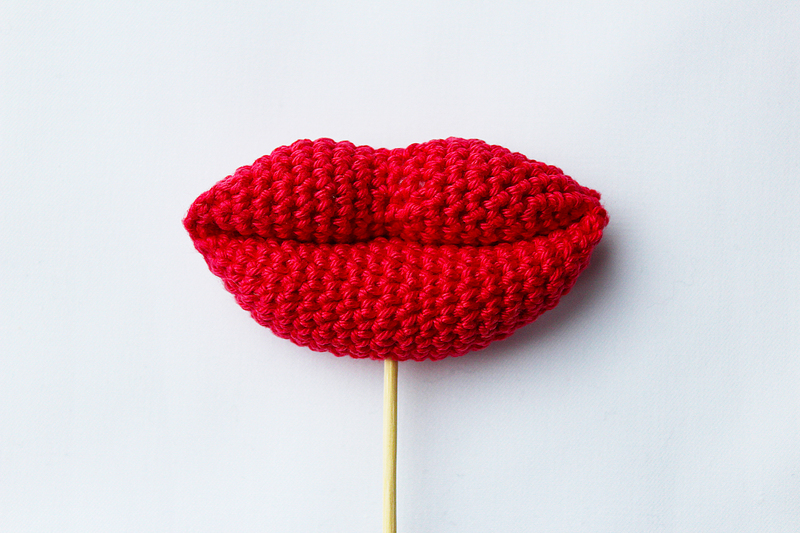 Use crochet hook 5.5mm. The sleeves are worked in continuous rounds. 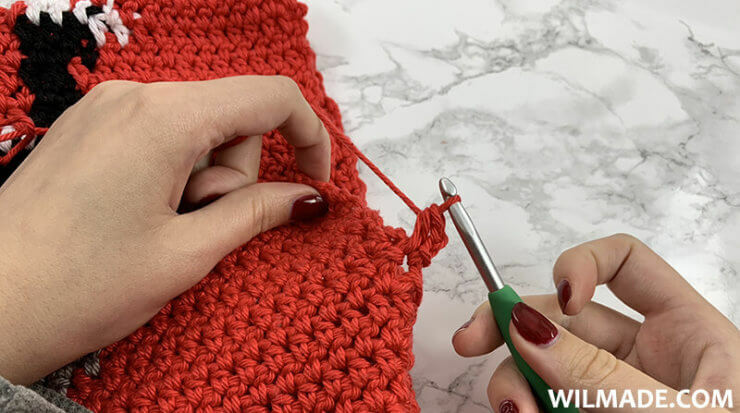 Start with red and join with a slip stitch at the base of an armhole opening. Make normal hdc stitches (which means you insert the hook through 2 loops instead of 3 like we did before). Repeat last round two more times. Sleeve should measure 48 (51, 54)cm / 19 (20, 21)”. 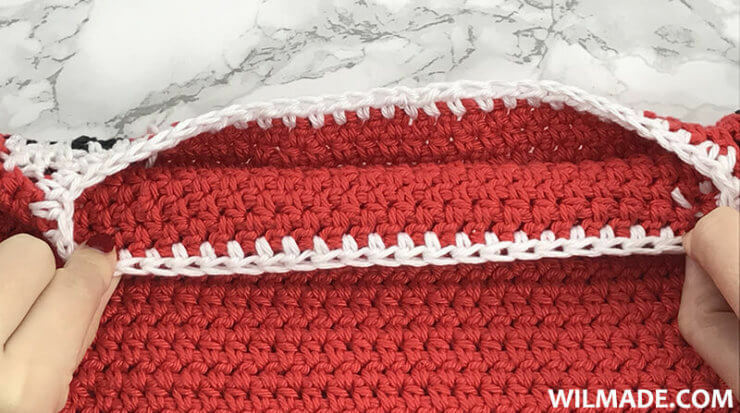 You can adapt the length of the sleeve by making more (or less) rows with red before starting with white. Repeat sleeve on the other sid e.
We need to make a ‘pocket’ for the phone. 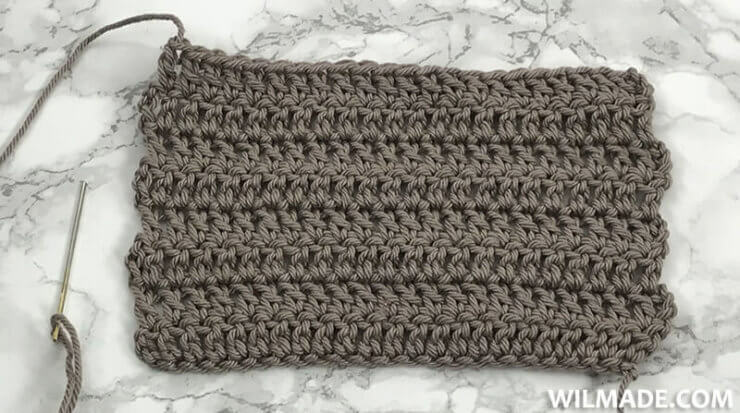 Use brown yarn and crochet hook 5.5mm. Chain 20 + 3 turning chains or as many chains as you need for the size of your phone. Finish off. Sew pocket to the inside of your front panel behind the eye gap. Close bottom and both sides of the pocket. Do not close the top. Install the free app ‘Morph DigitalDudz’ and navigate to ‘Ugly Christmas Sweaters’ > Rudolph eyes. Click on ‘play animation’ (the green button) and again, click on ‘play animation’ (the orange button on the bottom). Zoom in a little bit and make sure the eyes are completely visible on the screen. Tap on your screen and lock the animation. Now you’re ready to steal the show! By the way, if you don’t have time enough to make your own sweater, you can buy awesome sweaters via the Morph DigitalDudz app! 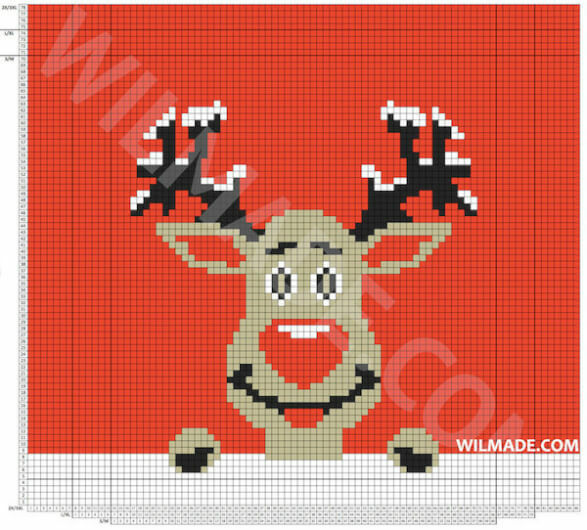 I would love to see the Digital Reindeer Christmas Sweater you made and the different yarn/color choices. Please share some pictures on Facebook and Instagram, you can tag me on Instagram with my username @wilmawestenberg. 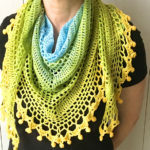 Don’t forget to add this pattern to your Ravelry queue here. If you have any questions about this Digital Reindeer Christmas Sweater or any of my other patterns, feel free to join my Facebook Group. I created this group for you to share pictures/ progress, ask questions and to help each other out. Very cute Idea…be careful putting a phone that emits radiation near your breasts…could cause cancer. Wauw, wauw, wauw. Wat een ontzettend gave trui (ik zei het al op instagram, maar laat het je nog een keer weten) Echt super mooi. Bedankt voor je mooie patroon.